When coming back to home after traveling abroad, the case probably happens: "The wanted foreign DVD we got fails to play on computer or TV". Why? Region code stops us. Commercial DVD uses region code as a protection to prevent from playing on DVD players and DVD drives with different region codes. A UK DVD will involve in playback error in USA unless there is a region-free DVD player allowing you to play DVDs from any countries or a DVD region killer software to circumvent all region codes. In the vast market, we carefully pick out the following top 3 DVD region killers working on Windows (10) and macOS (Mojave) to remove DVD region codes for a trouble-free playback. WinX DVD Ripper Platinum is a top-notch DVD decrypter enabling users to make a digital copy of DVD with ease. It features DVD copy-protection management. Since all region codes (1/2/3/4/5/6) will be bypassed during DVD ripping process, you can play any region DVD anywhere like play USA DVD in UK. And, a region free resulting file compatible with a vast of media players will be outputted. This DVD region killer is also available to remove other encryption schemes, like CSS, UOPs, Sony ArccOS, Disney DRM and even more strict protections on new-release DVD movies. 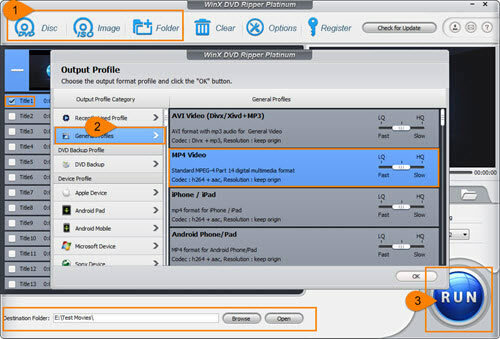 This DVD ripper also offers hundreds of output video/audio formats and device profiles, including MP4, AVI, WMV, MOV, WebM, FLV, 3GP, MP3, AAC, AC3, iPhone, iPad, Android, Windows Phone, Surface Pro, PS3/4, Xbox, Apple TV, Chromecast etc. It has 4 copy modes: DVD to ISO, DVD to VIDEO_TS folder, DVD full title to MPEG2 and DVD main title to MPEG2. WinX DVD Ripper Platinum is proud of its fast ripping speed. Taking full advantage of GPU acceleration, Hyper-threading Tech and Multi-core Utility, it only costs roughly 20 minutes to handle a two hour movie. A faster speed can be achieved with higher computer configuration. In addition, High Quality Engine optimizes image and audio quality. We want to highlight "Safe Mode" helping avoid sudden interruption or other errors and finish DVD ripping task perfectly. 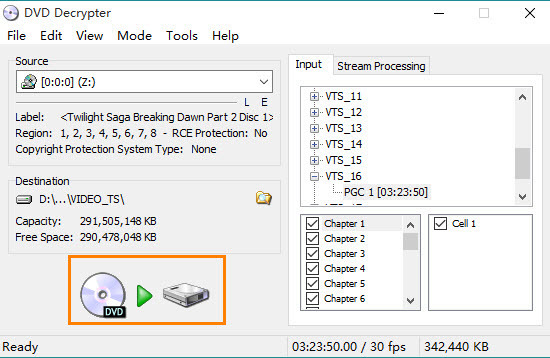 MakeMKV is a light piece of media format converter software, which aims to transcode DVD and other video formats to MKV while keeping most information like all video/audio tracks, chapters of original disc/video source with no change. It shows powerful ability to tackle encrypted DVDs helping you remove all region codes of discs, CSS and other protections. MakeMKV allows you to select single or multiple/all chapters to convert. The minimum title length (in 120 seconds by default) can be modified to skip some disturbed chapters. Also, the stream service is pushed out enabling you to instantly stream selected item to various players/devices without conversion. It released a free beta version with time-limited functionality in 60 days. This beta version can fully support DVD and Blu-ray. MakeMKV only outputs MKV making some users have to use video converter to get a resulting file with other formats. Its interface is not so easy-to-understand so beginners may need a guide before using it. But, working as a DVD region killer, it becomes one of the best alternatives for some free DVD rippers (for example HandBrake) which cannot rip copy-protected DVDs. DVD Decrypter is a famous DVD ripper for copy-protected DVDs, which can back up DVD content to hard drive with removal of copy protections. It features switching a region code encrypted DVD to a region-free copy. And other encryptions like CSS, user operation prohibition, Macrovision content protect and more. It is quite easy to use. DVD disc and main title will be automatically detected after you insert one into DVD drive. Then, you just need to set destination and click the "DVD to HD" image button to start DVD copy process. By default, DVD copy protection removal options have been checked for every mode (File, IFO, ISO Read and ISO Write). You can open Settings dialogue box under Tools and check and reset decryption options. You can also manually set region code with this DVD region killer. Click Tools > IFO > Region Path and then make one IFO file region free or transfer it to other regions (1/2/3/4/5/6 and special 7/8). DVD Decrypter had stopped developing in 2005 for legal issue. Therefore, it cannot well handle copy protections on newly released DVDs. And, there is no official support for you to fix various errors (for example failed to set data for "DVDDecrypterPlayDVDMovieOnArrival") or bugs. All the above DVD region killer software can make a region-free copy of encrypted DVDs. WinX DVD Ripper Platinum wins No.1 place. First of all, besides region codes, it continues developing to support new protections. Secondly, it has abundant outputs not only including mainstream video/audio formats, but fashionable devices. 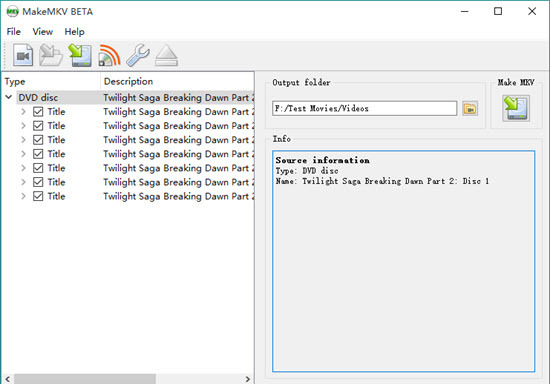 Thirdly, it allows users to edit DVD video and adjust parameters. Last but not the least, it delivers high performance with fast ripping speed and high quality of output digital copy of DVD. Free Download WinX DVD Ripper Platinum to Remove DVD Region Code and More Protections! WinX DVD Ripper Platinum can easily circumvent region codes (1/2/3/4/5/6) as well as other protections, like CSS, UOPs, Sony ArccOS, Disney DRM and new schemes on latest DVDs, to output digital files in MP4 (H.264/H.265), AVI, WMV, MOV, WebM, FLV etc, for playback on PC/Mac/devices with no trouble. It can deliver high quality and fastest speed! It is the review on the best DRM media remover / converter software that can remove Walt Disney X-project DRM, CSS, Region Code and other DRM protections in DVDs, ISO files and DVD folders. To change DVD region code is an available way for playing foreign films on computer successfully. Follow us to change or remove region code on DVD disc in Windows/Mac. It leads you to remove copy protection from DVD with the fastest DVD copy protection removal software helping you watch any DVD movies on Windows (10) PC/Mac and portable devices without problem.